Alice often examines star maps where stars are represented by points in a plane and there is a Cartesian coordinate for each star. Let the Linearity of a star map be the maximum number of stars in a straight line. For example, look at the star map shown on the figure above, the Linearity of this map is 3, because the star 1, star 2, and star 5 are within the same straight line, and there is no straight line that passes 4 stars. You are to write a program to find the Linearity of a star map. Input will contain multiple test cases. Each describes a star map. For each test case, the first line of the input contains the number of stars N (2 <= N <= 1000). 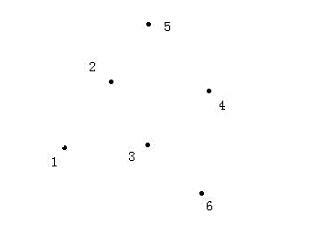 The following N lines describe coordinates of stars (two integers X and Y per line separated by a space, 0 <= X, Y <= 1000). There can be only one star at one point of the plane. Output the Linearity of the map in a single line.